Quick update before I head out into Belfast for a few beers! Description: Dark brown, transparent, small off-white head. Sour yeast smells, but with some nutty malt and chestnut in the background. Oaky. 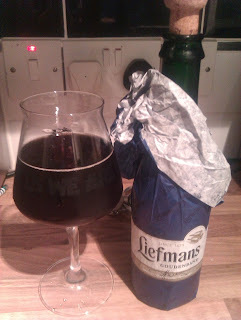 Again you can taste the oak, a nice sourness, but slightly porter like. Mid bodied and coats the mouth, long sour finish. Thoughts: Enjoyed this, not very “beery” (in fact my wife said it reminded her of wine – probably the oak), but sour and complex. 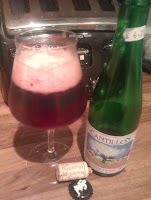 Plenty going on – hides its ABV well but plenty of kick too. A good one try – but it might be a bit marmite. Description: Creamola foam red, with a big pink head. Cloudy. Aroma of cherries, marzipan, and lots of tart yeasty dough sourness. Taste of very tart dark cherries, plenty of sourness. Light but a wee bit sticky. Dry, long bitter finish. 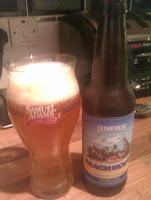 Thoughts: Mmm, this was good, very good. I love a tart fruit beer and this was right up there. Very sour but very drinkable. Will be buying more of this. Description: Dark brown with a white head. Toasted malt and vanilla small, but not as strong as I was expecting. Some milk chocolate malt. Where is the booze and the vanilla the label promised me? Strangely light bodied. Thoughts: This is the anti-Bourbon County Stout. No booze, no flavour, no interest. I'd avoid. Description: Straw yellow in colour, slightly cloudy, big white head that lasted well. A lot of fruit on the nose (peach?). Fruit flavours, a little hops, no real bitterness. Light, fizzy, with a chalky dry finish. Thoughts: The taste of this wasn't too bad (if a little dull) but the chalky finish didn't do much for me. Couldn't see me buying this again. I missed Beer Club Belfast on Thursday due to family commitments but I really hope to make the next one!